Greatest hits albums are always a bit of a guilty pleasure. Instead of taking the time to go out and buy the albums of an artist, you get a compilation of whatever were their most popular hits, or what should have been hits. They’re music’s form of Cliffs Notes. They’re convenient, easy and tell you just what you need to know. All the filler is edited out. But, if you’re going to buy an album of an artist that you’ve only heard about, greatest hits are a good way to start. Like a handful of other bands, the MC5 played punk rock in the late ’60s, well before there ever was such a thing. The group’s combination of growling guitars, political manifestos and frenetic live shows would later influence a generation of musicians in the late 1970s. The group, which included lead singer Rob Tyner, guitarists Fred “Sonic” Smith and Wayne Kramer, bassist Michael Davis and drummer Dennis Thompson, was based in Detroit (MC5 means “Motor City 5”). And as Kramer says in the linear notes, the group’s cult following was born in the scattered industrial centers of the Midwest. Begun as an ordinary cover band playing small dives, the group morphed into a musical beast, spearheaded by Kramer’s and Smith’s twin-guitar assault. Their sound seemed to mirror their industrial surroundings. Somewhere along the line, the group became involved with philosopher and hippie guru John Sinclair. Sinclair was the founder of the radical White Panther Party and he would eventually become the MC5’s manager and their political conscience. Sinclair and the White Panthers supported the Black Panther Party and advocated cultural revolution. Sinclair demanded free access to the media, abolition of money and — you guessed it — power to the people. What the MC5 shared with Sinclair and the Panthers more than anything, which carried over into the music, was a sense of defiance and experimentation. The music was the sound of revolution, and the Panthers offered a part of the message. 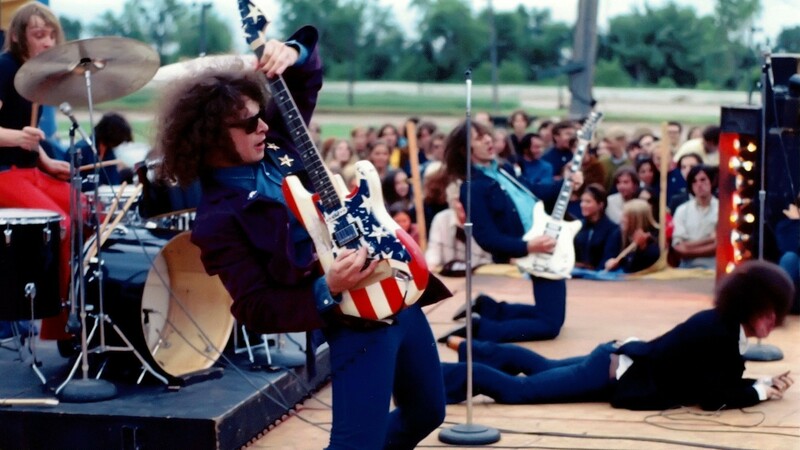 Beneath the deafening roar of their guitars, the MC5’s music is a lot more dynamic than it appears. The group embraced influences like Sun Ra, Marvin Gaye, Chuck Berry, James Brown and John Coltrane, though their aggressive guitar work sometimes threatened to wash that out. The group released only three albums, “Kick Out The Jams,” “Back In The USA” and “High Time,” before disintegrating as a result of infighting, record company neglect and drugs. The band members went their separate ways and into obscurity. But it wasn’t until groups like the Clash, the Ramones and Elvis Costello talked up the MC5 in interviews that they gained recognition. Though Kramer had the most successful (well, sort of) solo career, “Sonic” Smith eventually married Patti Smith, and the two released a few low-profile records before he died in the early 1990s. Vocalist Rob Tyner also passed away in the ’90s. This new anthology features songs from their three albums, as well as a few early singles and a couple of leftovers from after their last record. And as you might expect from a “best of,” it’s a great album. The album erupts with some early singles: “I Can Only Give You Everything,” “Looking At You” and “I Just Don’t Know,” which feature the frenzied howl of the group’s dual guitars, Tyner’s reckless shouting and a bashing rhythm. Hearing the first few cuts, it sounds like the microphones they used in recording couldn’t capture half of the noise they were making. The album gets going properly with the title cut from the MC5’s first album, “Kick Out the Jams.” With lunging guitar lines, the song is an assault on your senses and incites a riot. “Rocket Reducer No. 62 (Rama Lama Fa Fa Fa)” sounds like the group borrowed some feedback from Jimi Hendrix. By the time the album gets to “Teenage Lust,” the group’s versatility begins to come forward. The song has doo-wop backup vocals and a crystalline guitar breakdown, in addition to some stinging riffs. “High School” is another welcome change, sounding almost mechanized with rough guitars ebbing and flowing, while the drums sound like he’s playing on some boxes and a couple of pipes. “Back In The USA” is a throwback to the early ’50s with boogie-woogie piano and Berry-esque licks. The musical apocalypse that is “Sister Anne” forms the album’s centerpiece. Faint piano bits are contrasted with a devouring wall of guitars. Throughout the tune, Tyner can barely make himself heard above the driving rhythm. Just when you think nothing can overtake this monster, Tyner seems to give up singing and opts for some slicing harmonica breaks. The song reaches its zenith with singing from female backup singers — in the spirit of their Motown neighbors — while the guitars crash about. The song ends slowly with a sluggish marching band playing the outro. One of the strangest selections, and one of album’s best, is “Miss X”, which is almost reminiscent of a power ballad. The guitars roll over themselves, mimicking church bells, as the music repeatedly crescendos. The last song, “Thunder Express,” is another revisiting of “Johnny B. Goode.” This time the instruments are more distinct, and it seems that they finally removed removed some of the gunk on the microphone they used to record. It might go against the punk ethos to buy what is essentially the record company’s attempt to cash in on an un-commercial group with an album that is as commercial as possible. However, it doesn’t really matter. The most that record companies can hope for is that a “best of” will prompt listeners to buy the rest of their albums. In this case, it will. ©Copyright 2000 by David Hyland. All rights reserved. This material may not be published, broadcast, rewritten or redistributed. Tags: "The Big Bang -- A Best of the MC5", anthology, Dennis Thompson, Detroit, Fred "Sonic" Smith, MC5, Michael Davis, Michigan, review, Rob Tyner, Sinclair, Wayne Kramer. Bookmark the permalink.